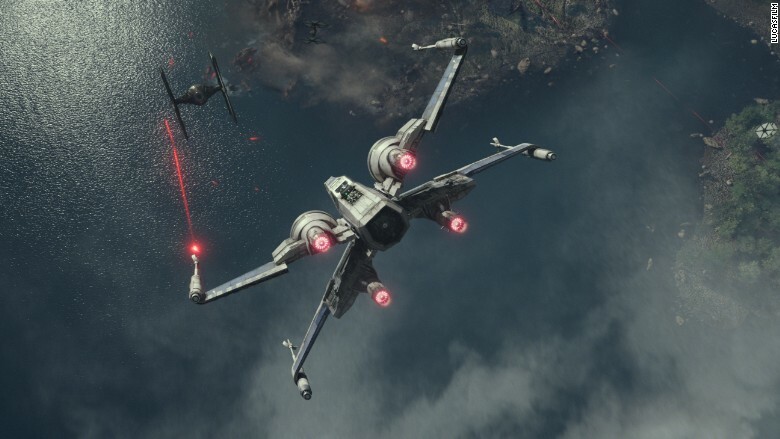 "Star Wars: The Force Awakens" has destroyed box office records like the Death Star. The Disney (DIS) movie continues to draw crowds to theaters in the U.S., and it's been a big draw around the world. The blockbuster broke records for biggest box office on an opening weekend in both the U.S. and globally. And Disney said it also became the fastest film ever to reach the $1 billion mark at the global box office. 12 -- The number of days it took the film to net $1 billion in ticket sales worldwide. That's an industry record. $529 million -- The global box office opening of the film, which beat the previous record of $525 million held by "Jurassic World." $248 million -- The film's opening weekend box office in North America, which overtook the $208.8 million record of "Jurassic World." $119.1 million -- How much the film brought in on December 18, its opening day in the U.S. That is roughly $30 million more than the previous opening-day record. $50.6 million -- The film's opening box office in the United Kingdom. 58% -- Percentage of its opening weekend audience that was male. 63% -- Percentage of its opening weekend audience over the age of 25. 94% -- The film's score on review site, RottenTomatoes.com, as of December 27. 47% -- Percentage of the opening weekend box office total that came from 3-D screenings. 4,134 -- Number of theaters the film opened in. $57,568 -- The film's per theater average on opening weekend. That was a record for a widely released film. $4 billion -- The price Disney paid for the franchise's production company, Lucasfilm, in 2012. $4.3 billion -- How much the "Star Wars" franchise made since its original installment in 1977, not including "The Force Awakens." $1.4 billion -- 1977's "Star Wars" U.S. total box office, adjusted for inflation. 10 -- Number of years between the last "Star Wars" film, "Revenge of the Sith," and "The Force Awakens." 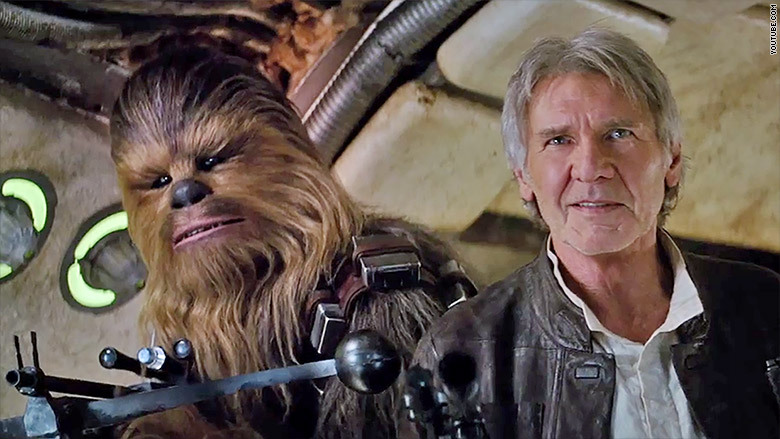 32 -- Number of years between "The Return of the Jedi" and "The Force Awakens." 73 -- Age of Harrison Ford, who plays the film's iconic hero, Han Solo. 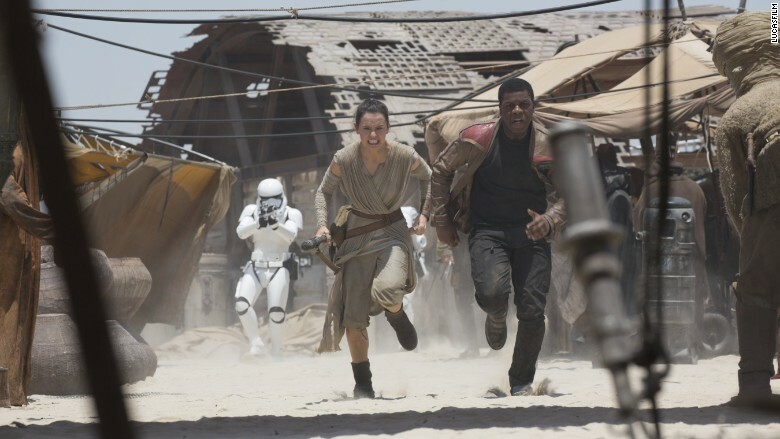 3 -- Number of "Star Wars" films in the top 15 biggest U.S. box office films of all-time, adjusted for inflation. 20 -- Duration in hours of the "Star Wars" movie marathon that took place in theaters across the country before the film opened. 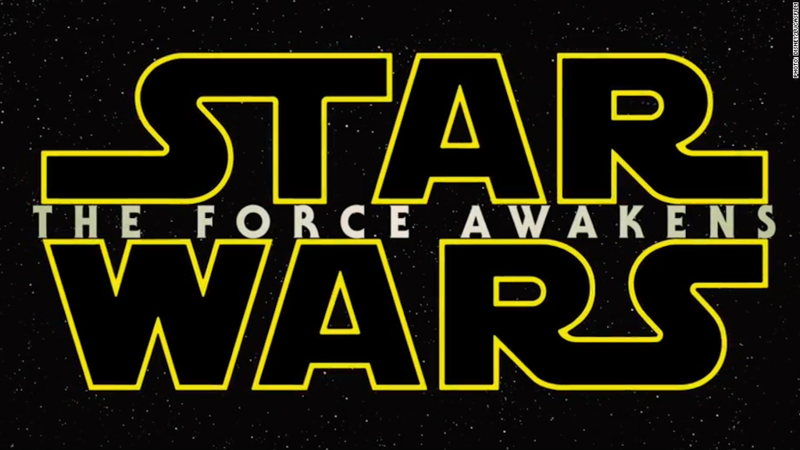 January 9, 2016 -- "Star Wars: The Force Awakens" opens in China, world's second biggest movie market. December 16, 2016 -- Days until the U.S. release of "Rogue One: A Star Wars Story," Disney's first "Star Wars" spinoff film. May 26, 2017 -- Days until the U.S. release of "Star Wars: Episode VIII," the next chapter in the "Star Wars" saga.